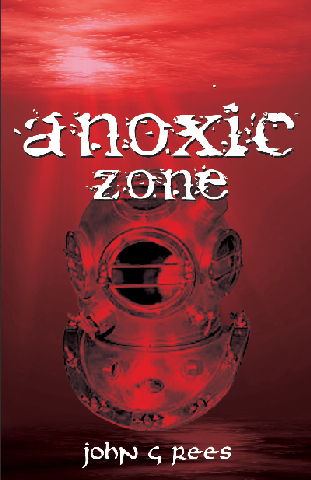 This horror book, anoxic zone by john g rees, is a look at the near future out of control. Or actually in control – by Megacorp, a company that owns and runs just about everything in this not too distant world. Megacorp is what its name implies: a massive worldwide organization that dominates and owns almost everything and everyone. Its decisions were capitalistic and paramount. It did whatever it had to do to increase shareholder dividends. Whatever would make money. This is a forward – looking story about two salvage divers, who live a rehearsed existence of life and death, until one day life took on one less death and everything changed. Suddenly thrust into a world of horror and blood, a sphere of greed and gore, these two guys figure it out and are not really sure that they want to! But with what they’ve learned and what they now know, they will change the future of the earth. The Earth is in ruins and the oceans are filled with treasures waiting to be found. The remains of the once-industrial age, hundreds and thousands of feet down under the sea; these were the new riches of the planet now. The book is about salvage: search and recovery. The two main characters travel on the sea, under water and in the mountains. Sailing and flying through the air, surfing and sliding, all the while searching; on the road to discovery about themselves, the road to perception of how they came to be and the road to distraction, as it seemed to be the only way not to lose one’s mind. From the islands of Hawaii to the Black Sea, their journey of revelation takes them and the reader through their growing awareness of their own truly personal Hell and to figure out how and if they can escape from it. Pure of mind and heart, their story is sad and funny at the same time. There are times the reader can’t believe they are are laughing. Disgustingly amusing, one might say. When you are out there looking for something, you never know what you might find. Usually I don’t read article on blogs, however I wish to say that this write-up very compelled me to try and do it! Your writing taste has been amazed me. Thanks, quite great article. I simply want to tell you that I’m newbie to blogs and truly enjoyed this web blog. Very likely I’m going to bookmark your blog post . You surely come with awesome articles and reviews. Bless you for revealing your blog.